LOS ANGELES – Oscar De La Hoya and Golden Boy Promotionshosted the final press conference at the Biltmore Hotel in downtown Los Angeles Thursday for Saturday’s stacked 10-fight card at StubHub Center in Carson, Calif. The first live bout is at 2 p.m. PT. In the main event of a tripleheader live on SHOWTIME® (10 p.m. ET/7 p.m. PT), former four-division world champion Robert “The Ghost” Guerrero (31-2-1, 18 KOs), of Gilroy, Calif., returns from a 13-month layoff to face offensive-minded, hard-hitting Yoshihiro Kamegai (24-1-1, 21 KOs), of Sapporo, Japan, in a 12-round welterweight bout. 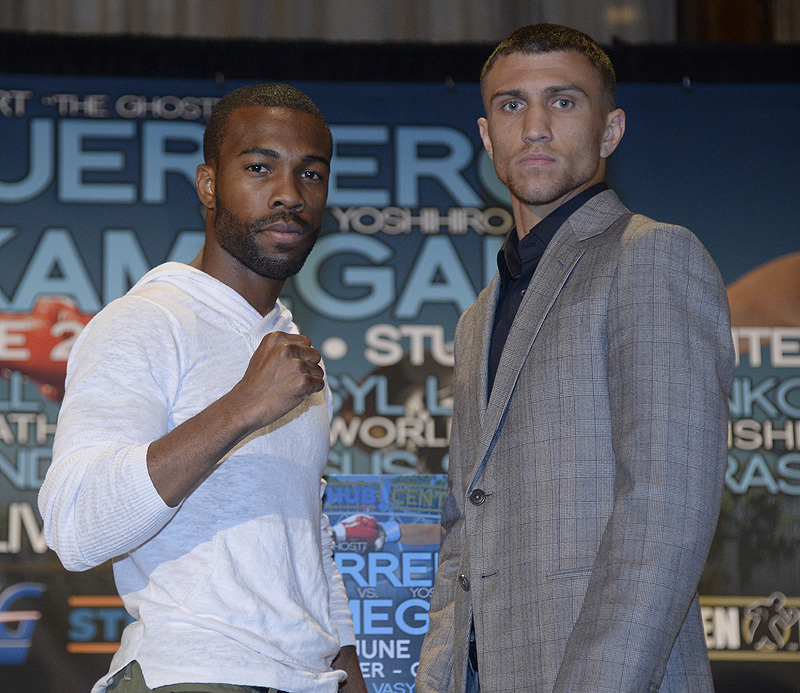 The co-feature on SHOWTIME CHAMPIONSHIP BOXING is a clash of exciting southpaws, undefeated yet untested Gary Russell Jr. (24-0, 14 KOs), of Capitol Heights, Md., against perhaps the most prolific amateur boxer of all-time, Vasyl Lomachenko (1-1, 1 KO), of Ukraine, in a 12-rounder for the vacant WBO Featherweight World Championship. 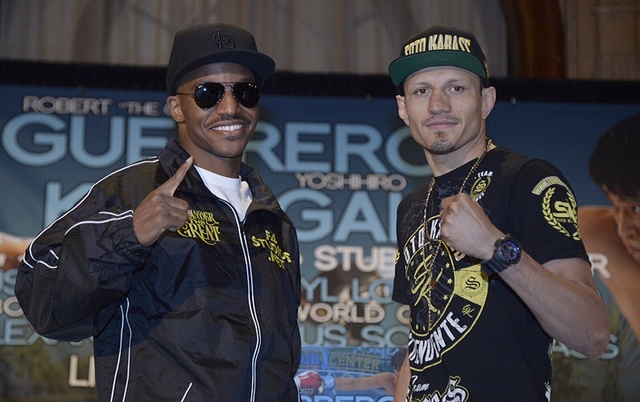 The telecast will open with former two-division world champion Devon Alexander (25-2, 14 KOs), of St. Louis, facing the always-dangerous Jesus Soto Karass(28-9-3, 18 KOs), of Los Mochis, Sinaloa, Mexico, in a 10-round super welterweight match. Former light heavyweight world champion, “Bad Chad” Dawson (31-3, 17 KOs), of Las Vegas by way of New Haven, Conn., makes his first start in 12 months when he takes onGeorge “Honey Boy” Blades (23-5, 16 KOs), of Indianapolis, Ind., in the featured bout onSHOWTIME EXTREME® (8 p.m. ET/PT, delayed on the West Coast). In a battle of U.S. Olympians in the SHOWTIME EXTREME co-feature, 2012 U.S. Olympian and undefeated heavyweight Dominic “Trouble” Breazeale (10-0, 9 KOs), of Los Angeles, makes his 10-round debut when he takes on 2004 U.S. Olympic team captain Devin “Devastatin'” Vargas (18-3, 7 KOs), of Toledo, Ohio. 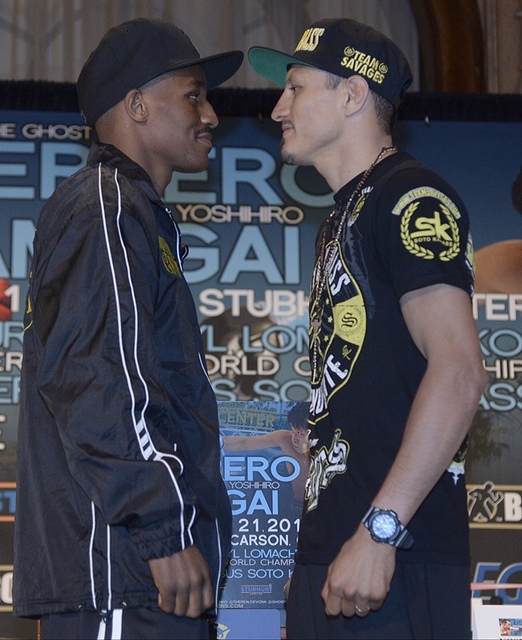 In non-televised fights: Vyacheslav Shabranskyy (8-0, 7 KOs), Los Angeles, makes his debut for GBP against Michael Grenga (15-14, 15 KOs), Lagos, Nigeria, 6 rounds, light heavyweights; Sharif Bogere (24-1, 16 KOs), Las Vegas, Nev., faces a foe to be announced, 8 rounds, lightweights; Michael Hunter (4-0, 3 KOs), Van Nuys, Calif., takes on Jerry Forrest (7-1, 6 KOs), Lafayette, La., 8 rounds, heavyweights; the brother ofMarcos “Chino” Maidana, Fabian Maidana (pro debut), Santa Fe, Arg., clashes withAlejandro Arteaga (3-8, 1 KO), Bakersfield, Calif., 4 rounds, welterweights; and Marcos Hernandez (1-0), Fresno, Calif., vs. Dante Spinks (0-4), San Diego, Calif., 4 rounds, super welterweights. 8777. For more information on group discounts or VIP packages, please call 877-234-8425. “I want to thank God for the blessings he’s blessed me with and my entire management team. It’s been a year and it’s time to get back in the ring. Since teaming with CrossFit, I’ve been doing so many different types of exercise and I feel great. “My weight is no problem and I’m ready to go. I’m here to make a name for myself. I know that people have problems pronouncing my name (“kah may guy”) so I want to make a great impact in this fight so they will learn to say it. 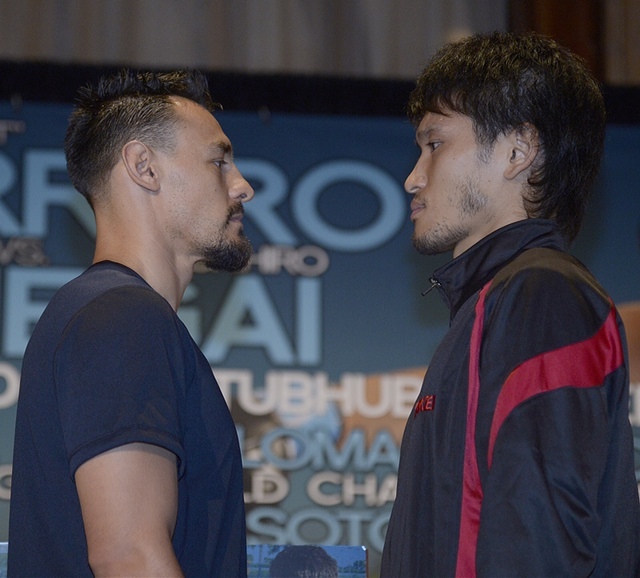 “Outside the ring I have the utmost respect for Guerrero. But inside, it’s all business. This is will be a good fight, a hard fight and my opportunity to become a mainstay in the fight game. “It’s actually a little funny standing here getting ready to compete for a world title based on the fact that I was never a fighter that said I wanted to be a world champion until I was on the U.S. Olympic team. “I was one of the favorites to medal (in the Olympics) and to not be able to compete was devastating. The only way that I could make it up to my fans and family was to become a world champion, plain and simple. “I want to thank everyone in my training camp and everyone who helped prepare me for the fight and my friends and family who are in Ukraine supporting me. “I want to thank my creator, without him I wouldn’t be here. I would also like to thank Golden Boy, Oscar, everyone involved. “Los Angeles is my second home. Coming off a loss against (interim WBA welterweight world champion) Keith Thurman, I want to come back and be impressive against Devon Alexander. He is fast, strong and has good foot speed, but I am ready to go. “I definitely feel that I am improving and prepared to fight my first 10-round fight. In camp, we picked up the cardio and conditioning, but we really haven’t changed a whole lot. “My last fight went eight rounds and it was the first time I’d gone the distance. But I always prepare to go the distance and for this fight I’m ready to go 10 hard rounds. But I’m really determined and always looking for the knockout. 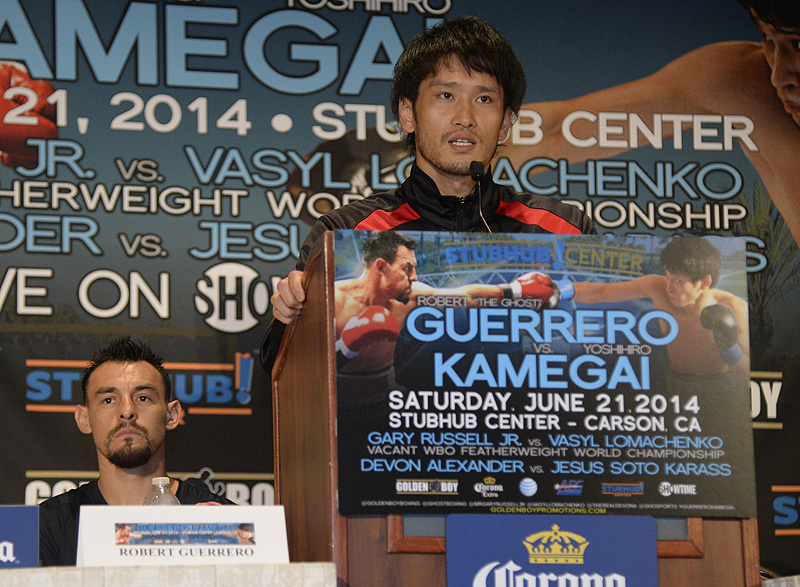 “I’m looking forward to this fight and want to thank all those involved for making it happen. This is a big fight for me, for both of us. He may be undefeated but he hasn’t faced anyone like me. “I don’t change for my opponents so I will keep my same style. I was able to get into the gym right after my last fight because it only lasted for 23 seconds. “I was able to watch a few videos on my opponent but I don’t know much about him. I won’t give anything away on my style of fighting, but I will fight to the best of my abilities. “Our SHOWTIME EXTREME fights have always been highly competitive. It is one thing we at Golden Boy and SHOWTIME pride ourselves on. We want to consistently present the most competitive fights in the boxing business today. “Chad Dawson is a great fighter who is back with a vengeance, looking to make a statement against a tough fighter in George Blades. For us, we look at this fight on SHOWTIME EXTREME as a great appetizer to the main course, which will also be very exciting. “Guerrero is back, he’s stronger, he’s faster. The new team that he is working with at CrossFit will make a huge difference coming off the biggest fight of his career against Floyd Mayweather. “That type of fight will elevate your game to a new level. 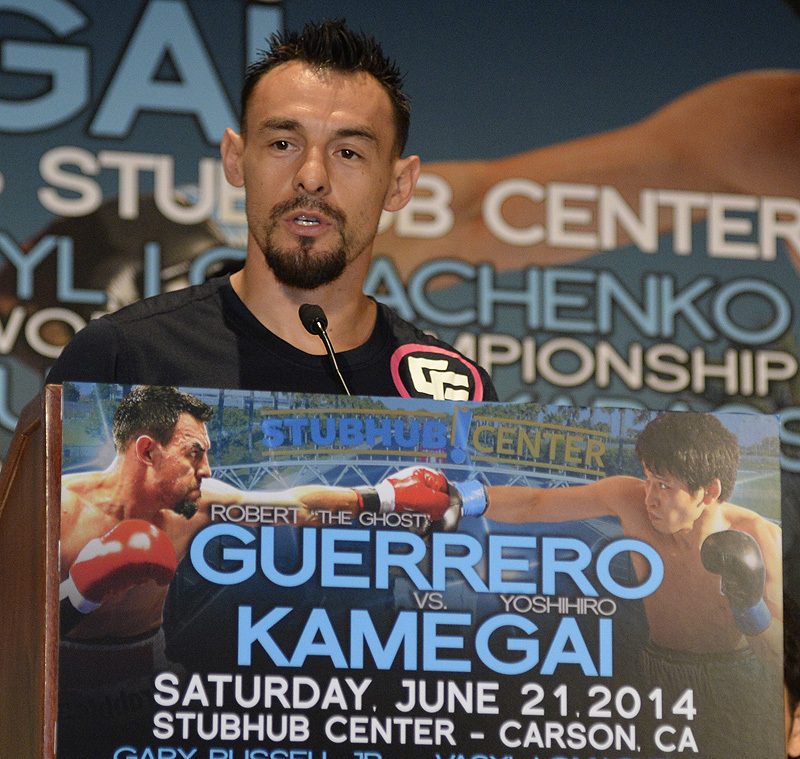 We are looking forward to Saturdayand witnessing a very much new and improved Robert Guerrero. For more information, visit www.goldenboypromotions.com,www.sports.sho.com andwww.homedepotcenter.com, follow on Twitter at www.twitter.com/GoldenBoyBoxing,www.twitter.com/shosports, www.twitter.com/StubHubCenter,www.twitter.com/GhostBoxing, www.twitter.com/MrGaryRussellJr, www.twitter.com/VasylLomachenko and www.twitter.com/TheRealDevonA, follow the conversation using #GuerreroKamegai or become a fan on Facebook at www.facebook.com/GoldenBoyBoxing, www.facebook.com/SHOBoxing andwww.facebook.com/StubHubCenter.